Roast Beef is my favourite Sunday roast, but choosing which joint to buy isn’t obvious for a beginner. My first choice would always be to buy a rib of beef – the meat is tender and the marbled fat adds tremendous flavour to the roast. Additionally, ageing, hanging the beef for between 21 and 45 days, allows endogenous proteolytic enzymes to break down structural and myofibrillar proteins – in English, that means the meat is tenderised naturally as it gets older. 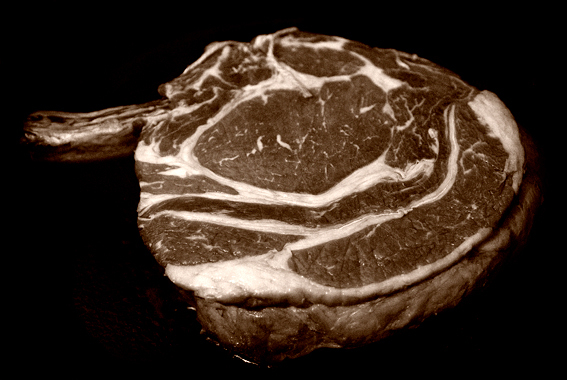 With dry ageing, some evaporation of moisture within the meat occurs and the flavour is concentrated. You will, most likely, need to buy your rib from a decent butcher. If a rib of beef is beyond your budget and you are tempted by the regular half price beef deals in supermarkets like Sainsbury’s, make sure that you don’t get fobbed off with a silverside joint. 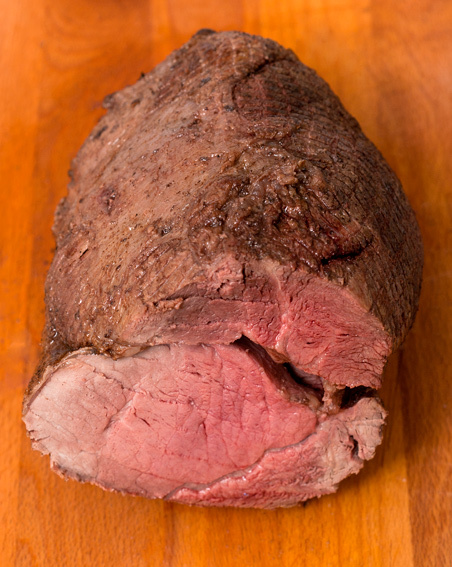 Silverside is tough and requires long slow cooking to make it tender – pot roasting would be ideal. Silverside is the cut of choice for making corned beef! Ideally, buy a cheap rump/top rump joint, that will be tender enough for a reasonable roast beef dinner. Additionally, very small joints cook quite quickly and shrivel up, it’s better to buy a larger 4 or 5 lb joint for a good roast. Cooked beef will keep for a few days in the fridge, it makes great sandwiches and can be used in stews, stir frys, chilis, etc. Take your meat out of the fridge, several hours before cooking. It will cook much better from room temperature. 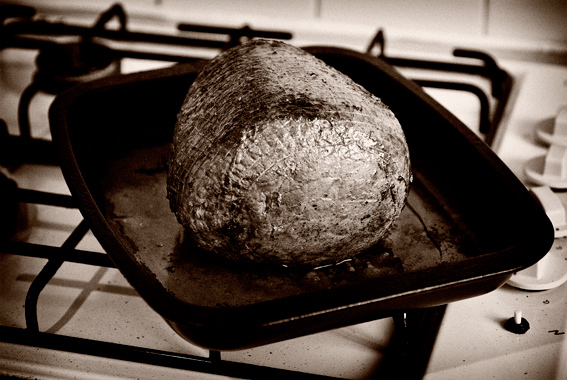 Preheat your oven to 250ºC. Brown your beef joint, all over, in a very large cast iron frying pan – I use a little goose fat in the pan and likewise I grease my oven dish with it too. Deglaze the frying pan with a glass or two of red wine and a little red wine vinegar – add this to your beef in the roasting pan. Season the beef with some sea salt and cracked black pepper. Put the beef in the oven and turn the temperature down to about 180ºC after about 5 minutes. Cook the beef for about 15 minutes per lb if you like it rare or 15 minutes per lb plus an additional 15 minutes for medium rare. I normally baste the beef every 20 to 30 minutes and turn it over half way through cooking. If you like meat burnt to a crisp, this isn’t the recipe for you – you might be better off buying beef burgers. Once the beef is cooked, wrap it up to keep it warm (aluminium foil is good for this) and let it rest for half an hour. This allows the meat to retain its juices and the temperature to even out across the joint. During this half hour you can cook your vegetables and make gravy with the juices in the oven dish (see my gravy recipe). You will find that some blood will come out of the meat while resting – don’t waste it, beef blood has lots of flavour, stir it into the gravy you are making, it will taste fantastic. Serve your beef with roast potatoes, Yorkshire pudding and mixed, seasonal vegetables. This entry was posted in Food, Meat, Recipes, Shopping and tagged ageing, beef, deglaze, gravy, rare, recipe, rib, roast, rump. Bookmark the permalink. Serious question… how is beef hung. Do we buy it hung, which seems to be way more expensive or can we hang it ourselves… it seems a scary thing to do . That’s a good question. Yes you buy beef already hung – the better the beef and the longer it has been hung, the more expensive it gets.